I love clothes and accessories and I’m not ashamed to say it. (I’m also not ashamed to quote Walden.) But how do I satisfy my desire for cute sweaters and tall boots while maintaining my political integrity and homesteader street cred? Two words: felted wool. Not just any felted wool either. We’re talking wool from sweaters reclaimed from the local thrift store where clothes are sold in bulk for 50 cents per pound. I buy used, 100% wool, merino, and cashmere sweaters for about 30 cents a sweater. I felt them at home in the washing machine. Then I cut out whatever pattern I want, sew the seams, and voila! 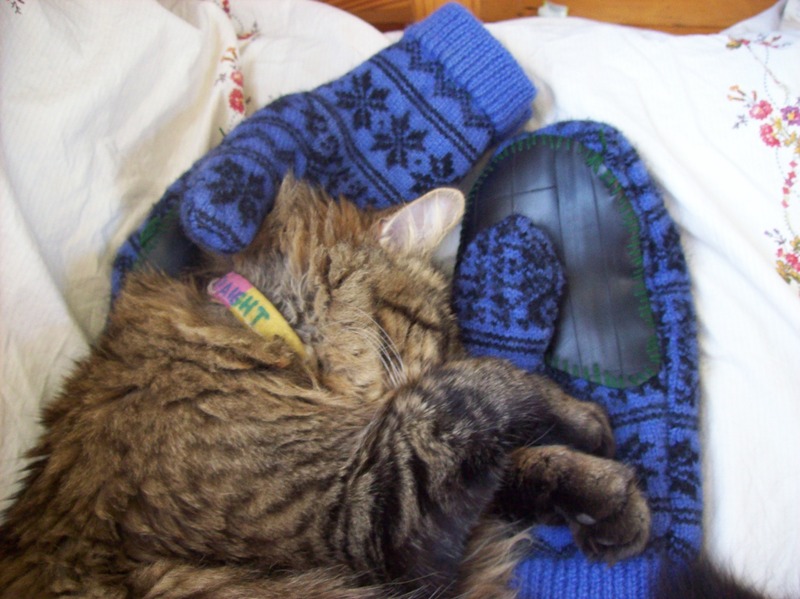 We have hand-crafted, felted wool mittens with cashmere lining and quirky embroidery. 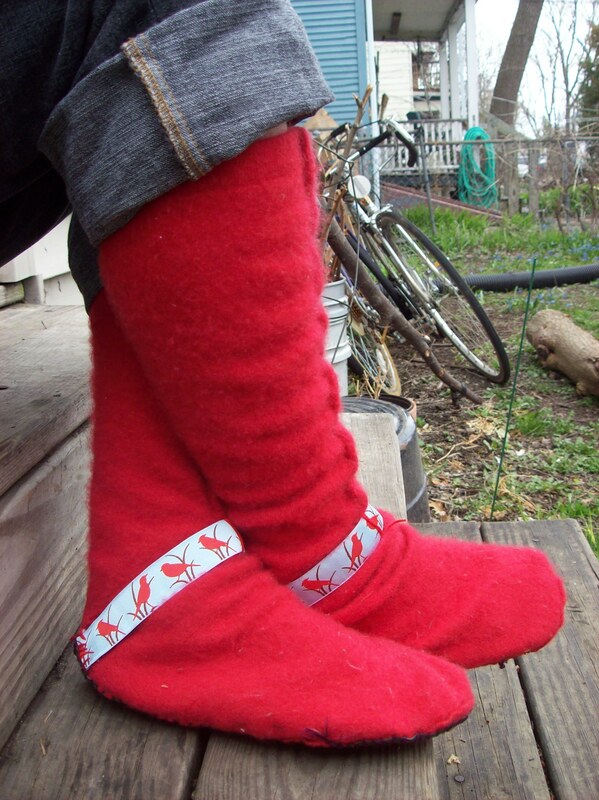 This winter I designed wool mittens for my sweetheart who bikes through the winter. I made them double layered to keep out wind. The inside layer is cashmere and the outside is a rougher, thicker, felted wool. Both layers used to be the sleeves of sweaters. I added bike tube palm pads for waterproofing. Bicycle shops throw out used bike tubes and give them away for free. I take the larger ones, slice them down the middle, and wash them inside. 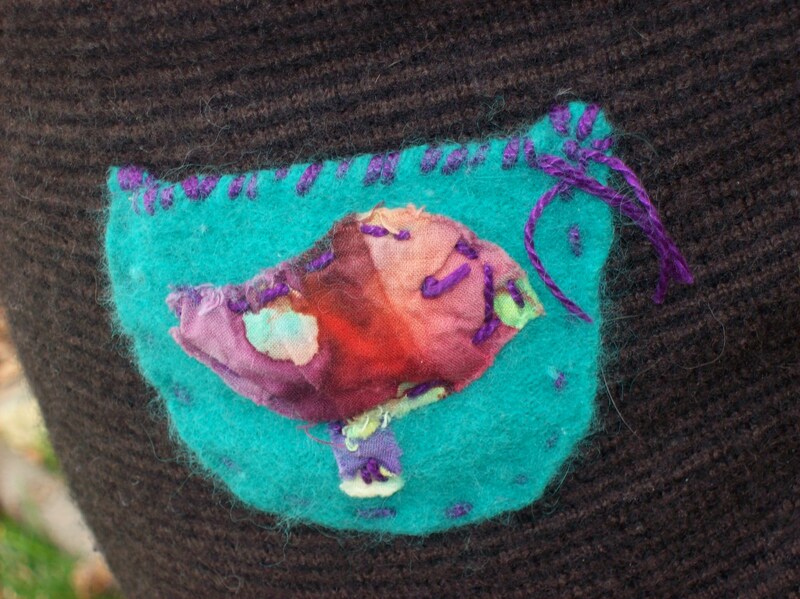 I sew with heavy duty, cotton embroidery thread and a big needle with a large eye. I make colorful, visible stitches that add to the aesthetic and advertise the handmade quality. I want people to see that I made this neat thing and think, “How would I make those?” And if they ask me, I’ll tell them. Wool is a natural, renewable fiber from sheep and goats. Animals do not need to be harmed to harvest wool (but beware: industrialized practices sometimes do harm the animals). Wool is very warm in the cold and stays warm even if it gets wet. It also breaths when you’re hot. It can be thick for sweaters, or woven thin and smooth for undergarments. Wool can be torn apart and felted back together. Wool does not absorb odors like other materials. Wool is very easy to work with and can be dyed with natural, plant dyes. High quality wool is available inexpensively in resale stores and bulk thrift stores. It is adaptable and will form to a mold when felted. Felting is the process of wool fibers being knitted more closely together. This can be done with small barbed needles (needle felting), or with hot water and soap. When you shrink a wool sweater accidently in the wash, you’ve felted it. It’s not fun to wear anymore, but it is now a stronger, more durable material with infinite potential futures as mittens, boots, vests, patches, shoes, hats, headbands, wallets, soap pockets, potholders, belts, legwarmers, bags, purses, funky jewelry, tea cozies and more. In a future post I will feature the dozens of handmade wool items in my household. Get an old wool sweater, preferably cashmere or something not too scratchy. If it is scratchy you can make a softer lining using the same pattern you used for the boots. Felt the sweater. Put it in a washing machine on hot with detergent. Dry it in the dryer. Make a pattern on paper (I use paper bags or newspaper) or right on the fabric. Lay your hand flat on the material and trace around it. Remember to add ½ inch for the seam. Cut out the wool material. Sew the edges together using just about any stitch. (I use a backstitch if the seam is inside and invisible, or a whipstitch if the seam is outside and visible. For info on stitches use the internet or your public library.) I use thick cotton embroidery thread. Make sure you sew the mittens inside out so the seam will be on the inside when your turn them right side in. Get an old, used bike tube, large size. Wash the inside of dust. Trace your pattern, palm, or mitten on the inside of the bike tube. Cut out the bike tube palm in the size of your choice. 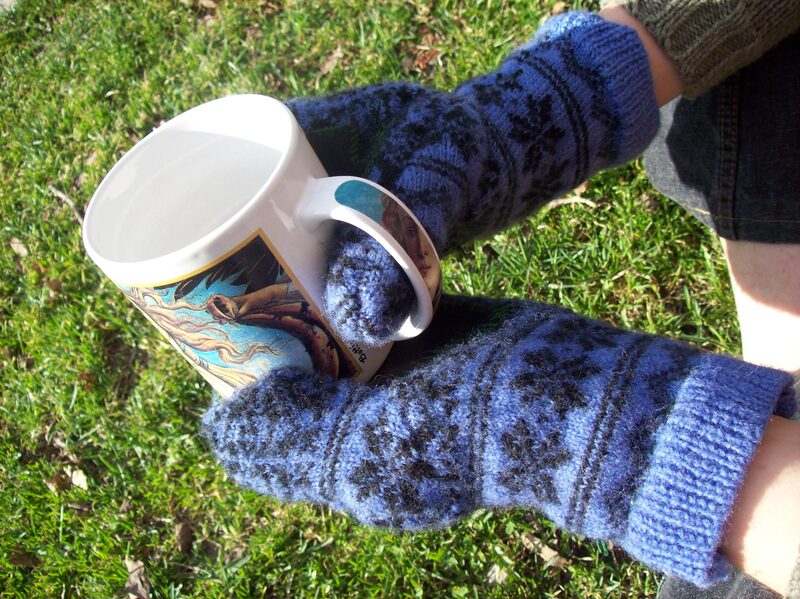 Sew it to the palm of your mittens using a whipstitch and cotton embroidery thread.